and has been selling Houston and its real estate since 1984. 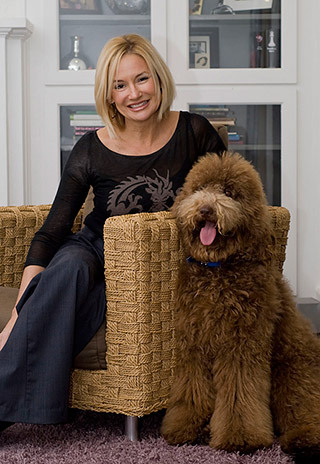 Regarded as an expert by her peers, previous clients and the media such as the Houston Chronicle, Houston Business Journal, 002 Magazine, KHOU – Channel 11, KRPC – Channel 2, New York Times, Hollywood Reporter, HGTV – Lofty Ideas, Better Homes and Gardens and more. Sandra has also contributed monthly to 002 magazine’s “Archichat” section, and prides herself in recognizing Houston architects by making them accessible in a public domain. Sandra is available to assist buyers, sellers, developers and those looking at the rental market in Houston. Specialty markets include new construction homes in West University, Southgate and the Medical Center areas; historic homes including Houston Heights, Montrose, Southampton and Boulevard Oaks; urban high density areas including Downtown, Midtown, Rice Military, Washington Avenue corridor, Museum District, Uptown Park and the Galleria; as well as all the high rise buildings in Houston including rental buildings. She continually ranks year after year in HAR’s Top Producer Realtor list out of all 25,000+ members. Sandra Gunn owns one of the most respected, productive boutique real estate firms in Houston. She is a native Houstonian and has been selling Houston real estate since 1984. Regarded as an expert of Houston real estate by her peers, previous clients and the media such as the Houston Chronicle, Houston Business Journal, 002 Magazine, KHOU – Channel 11, KRPC – Channel 2, New York Times, Hollywood Reporter, HGTV – Lofty Ideas, Better Homes and Gardens and more, Sandra and her team of professionals are available to assist Houston real estate buyers, Houston real estate sellers, Houston real estate developers and those looking at the Houston real estate rental market. Houston real estate specialty markets include new construction homes in West University, Southgate and the Medical Center areas; historic homes including Houston Heights, Montrose, Southampton and Boulevard Oaks; urban high density areas including Downtown, Midtown, Rice Military, Washington Avenue corridor, Museum District, Uptown Park and the Galleria; as well as all the Houston high-rise and rental buildings. She is an expert in all Houston loft buildings including St. Germain Lofts, Capitol Lofts, Kirby Lofts, Hermann Lofts, Rice Lofts, Bayou Houston Lofts, Empire Lofts, Franklin Lofts, Gotham Lofts, Stanford Lofts, Il Palazzo Lofts, Live Oak Lofts, Metropolis Lofts, Renoir Lofts, Washington Lofts, Manhattan Lofts, The RISE Lofts, Keystone Lofts and Paramount Lofts. © 2001 - 2019 Sandra Gunn and Associates LLC. Licensed Real Estate Broker. All rights reserved. No Part of this website may be reproduced without the written consent of Sandra Gunn Properties. All information provided is deemed reliable but is not guaranteed and should be independently verified. Some photos are for representation purposes only. Equal Housing Opportunity. >>> SIGN UP now to keep up with the ever-changing Downtown Houston housing options!